A great organization that I support just wrapped-up an online auction. Their experience seems to confirm what I always suspect, auction items that can be readily purchased outside of the auction typically lead to transactional bidding patterns. Meaning individuals will bid as long as they perceive that they are helping the cause and getting a deal. It is hard to inspire transformational giving through a computer screen. Here is a sampling of the results from an online auction. 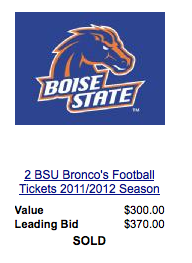 As you can see, the Boise State Football tickets went for slightly more than valued. 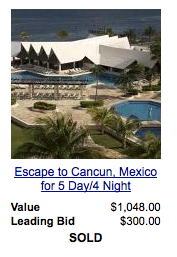 The Escape to Cancun winning bid was at one-third of the estimated value. 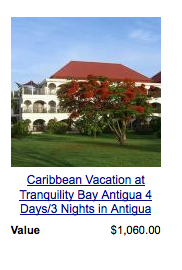 Finally, the stay in Antigua received no bids. The majority of the items in the online auctions that I have reviewed tend to fall into the middle range. Winning bids are 30-60% of the estimated auction item’s value. What does this mean? The bidder gets a deal but in reality they are technically not making a donation since their bid did not exceed the item’s estimated value, meaning there is no tax-deduction for the transaction (not a legal opinion). The nonprofit gets a portion of the proceeds but pays the online auction company for the software or an annual fee plus a percentage of the proceeds (starting near 10%) of the auction’s gross. Lastly, somebody donated the item and they hope to see the maximum value gained for their donation. If their item goes for a huge discount the feeling of success and appreciation is easily diminished. How do you maximize an online auction? Blend the value of the auction items so they mix a commodity with an experience that is challenging to replicate. A coffee card for $50 is fine but it is rarely going to generate its value. When you consider the time and effort that went into securing the gift card and then the resources required to register the item, the return on investment is limited. So what if you take the coffee card and include an invitation to have coffee with the founder of the cause? Or the mayor of the town? Or a celebrity? Suddenly supporters are bidding on an experience and get a coffee card on the side. Items that are perceived as commodities get treated as such. Experiences that offer a chance to connect with what somebody believes are regarded as treasure.